Kids Math Teacher: MaTh for 1st graders: Activities at the Beach! 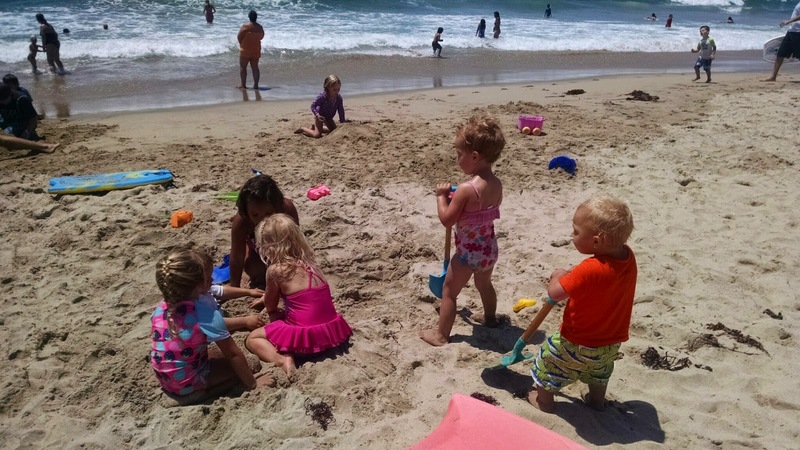 MaTh for 1st graders: Activities at the Beach! It has been a busy summer here! 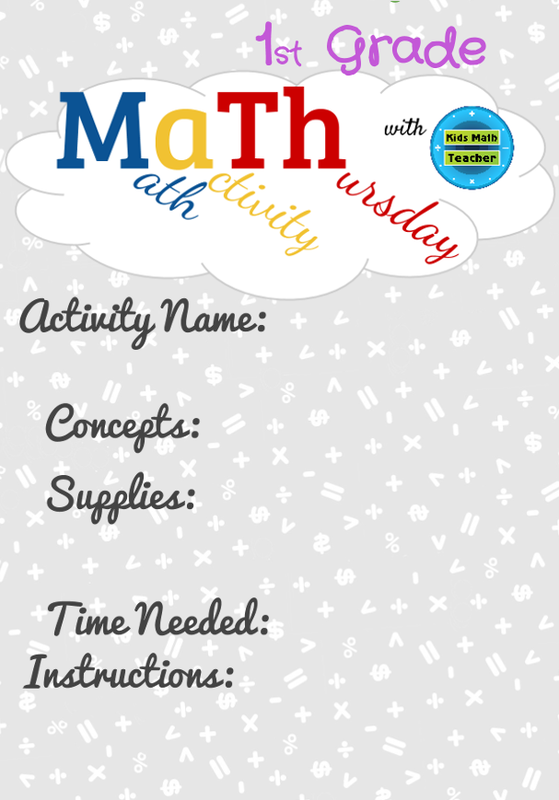 But it's time for 1st Grade MaTh (Math activity Thursday)! So, I have been busy but I have taken the kids to the beach a few times and I couldn't help to see all the math teaching opportunities there! 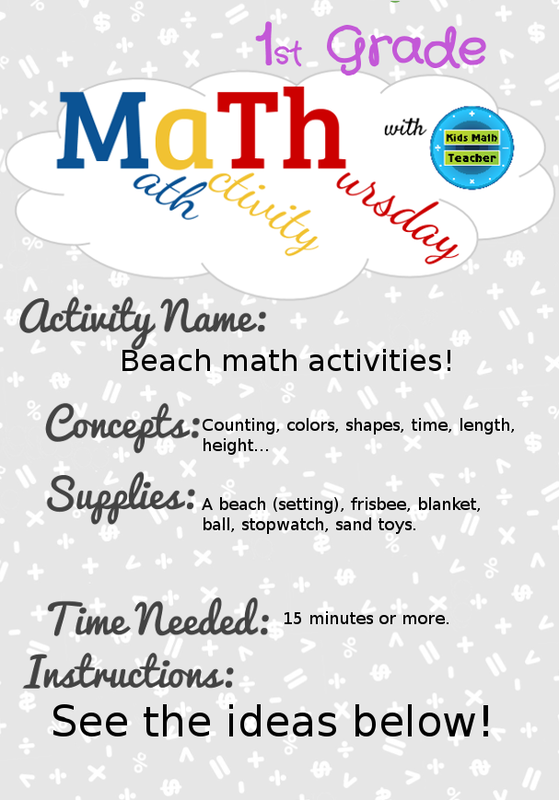 Activity Name: Beach math activities--a whole bunch of little things to do to make math part of every kids life and to help them realize math is all around them. Supplies: A beach setting (hopefully with sand), frisbee, blanket, ball, stopwatch, sand toys (and whatever else you normally bring). Time needed: Actually you can talk about these activities and do them for a few minutes or longer. The point is to make math and observations fun. Lay down your towel, how many kid foot lengths is the top? How about the side? What is the total perimeter in kid foot lengths? Have fun tossing a Frisbee... Throw it and let it land. How many equal steps did it land away from you? What is the farthest you can toss it? Observe all the colors around you. How many swim suits have green? How many have pink? Are there different colors in the grains of sand? Shapes. What shapes do you see? Are their circles? Rectangles? Any triangles? Time the waves crashing. How long is it between each wave? Can you time it between twenty consecutive waves? Is it always the same time between waves? Estimate how many waves crash in one hour. How about in one whole day? With your sand toys how high can you build up the sand? How long did it take? There are countless things to do with math at the beach. You can see how many boys and how many girls are there. 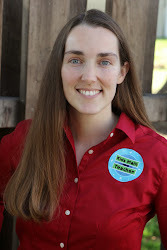 You can talk about temperature (of the air and the water). Height of waves. Take a certain distance and see how long it takes to run it. Does it take the same amount of time if you were on grass or cement?